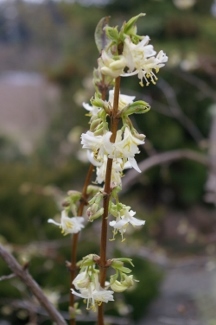 Joy Creek Photo Archive (c) all rights reserved Lonicera standishii is a wonderful deciduous shrub that surprises us with its delicious fragrance as we do our winter chores in our own gardens. Tiny paired white flowers appear at the leaf axils during the cold of the year. If sited so that it is backlit, the red berries that follow the bloom will glow amongst the leaves during summer. From China. Winter. 6 ft. x 6 ft. The flowers will release their fragrance for several days as part of a winter bouquet indoors.